Oatmeal Stout – Justin Thorp's blog – Page 121 – Grab a beer. Let's chat. An exciting new report has just come out that illustrates how the Web is changing. As the Wii continues to sell quite well month after month, analysts are becoming convinced that it’s no fad. A new forecast from Merrill Lynch suggests that Nintendo’s console will occupy around 30 percent of U.S. households by 2011, and even more in Japan. The Nintendo Wii has gotten people excited about playing video games again. When you go out in public and mention the Wii, you will be told tales of adventures with friends, a six-pack, Wii Bowling, or Wii Golf. But what does this have to do with the Web? You can surf the Web from the Nintendo Wii. Opera, the web browser, has a version which can be loaded on the Wii. Up and coming search engine Clusty has released a Wii version. The way we consume the Web has changed. You can surf the Web from your computer. You can surf the Web from your phone but you can also surf the Web from your living room. 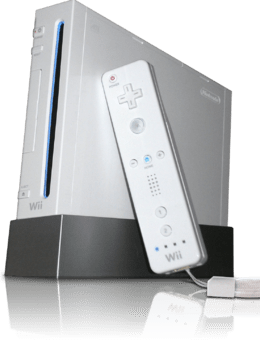 If there is a Wii in 30% of American homes, people will be able to surf the Web on their Wii with their TV from the comfort of their couch. It will change the way that Web developers will have to make them. As a developer, I will have to design my Web site in a way that it will be as universally accessible as possible to everyone, regardless of evironment, device, or situation. It isn’t feasible to expect people to make a Desktop version of their Web site, Mobile version, Nintendo Wii version of their Web site, and a version for every other Internet connected device that exists. We need to start looking towards the W3C’s One Web. I could totally see myself watching TV and want to check the new or a blog headline really quickly but not want to go all the way to my computer. I could just check the Web from the Wii. Do you have a Nintendo Wii? Have you used it to surf the Web? Would you Twitter with me? Seems like every early adopter in Silicon Valley is buzzing over the web 2.0 application Twitter. It allows you to let you friends and colleagues know what you are up to at any given time. You can communicate through instant messaging, sms, and their Web form. Obvious Corp., the company who runs Twitter, has just announced that they are abandoning their property Odeo, so that they can focus on Twitter. Is this that big? I haven’t actually seen any numbers on Twitter usage but I can’t imagine that they have tapped anyone but the early adopter crowd. I could never see my mom using Twitter…at least not yet! What do you get out of Twitter? It is nice to know what is going on in the lives of my friends but I don’t think that I could ever see Twitter becoming so folded into the day to day aspects of my life… that I would use it to record every single event. Even right now, I go hour or days forgetting to update my Twitter account and I don’t feel bad about it. Experiences go by that I could have recorded but didn’t. Twitter is a GREAT mobile live-blogging platform. If I’m at an event and I want to report back what is going on, I can communicate with Twitter via SMS. I can send short easy messages. It is much easier then trying to edit a WordPress blog using Windows Mobile Internet Explorer. It’d be cool if I could group Twitter messages to associate them with the bigger event that I’m reporting from. Twitter is also a handy way to share a few links with some of your friends. Godfather of CSS Eric Meyer seems to be grappling with the questions of Twitter. Anil Dash also points out that Twitter has a better chance of long term success because it has opened itself to allow people to build ontop of it. It may not be that Twitter in its current iteration is where it reaches mass market success. It may take someone being really innovative with the platform before everyone starts using it. Posted on February 22, 2007 Categories Web Applications2 Comments on Would you Twitter with me? What is OpenID and Why Should I Care? Recently, I have been hearing more and more about OpenID. For example, apparently Kevin Rose just announced at the Future of Web Apps conf. in London that Digg is going to be moving over to using the OpenID system. Apparently Microsoft and AOL are also moving in this direction. My first question was what is OpenID and why should I care. OpenID helps to solve the problem of having 30 different online services that you use and 30 different usernames and passwords for accounts that you have to keep track of. You think to yourself, “Wouldn’t it be easier to have one username and password for all these systems?” I can easily think of 20 different systems off of the top of my head that I keep track of. OpenID allows you to identify yourself using the URL of your home page or your blog, instead of a username or password. There would just be one box where you’d type in the URL of your identifier page that supports OpenID. When you entered your OpenID identifer URL, you’d be sent to that blog or home page system’s login page. You’d login and then you’d be redirected to the orginal system. You’d be authenticated with the original system and all would be good and right with the world. This is the way that I understand OpenID. Am I missing something? I feel like I should draw a picture. Any of you all been building web applications using OpenID? What are your thoughts? I have no experience with it. So much of our lives our online. You can’t underestimate the importance of having secure and usable digital identities. We need to be able to easily and safely use the sites we need and not have to worry about anything. Posted on February 21, 2007 Categories Web4 Comments on What is OpenID and Why Should I Care? Are Virtual Worlds Ready for Primetime? Recently, it seems like more and more media attention is being given to these new virtual worlds. They are these 3D computer environments which allow you to control the life of an avatar/character on your computer screen and interact with other people within the network. Linden Lab’s Second Life has been around for over a few years, has over 3.5 million new accounts that have been created and has gotten the most media attention. Robert Scoble just recently wrote about Outback online, from Australia. I think all these efforts are great but what needs to happen for these virtual worlds to make the jump from the geeky subculture to the mainstream. Second Life’s head Philip Rosedale has admitted that it has a pretty steep learning curve, which has caused a very very low retention rate of Second Life users. Can Outback Online learn from this and create their interfaces in a way to get beyond these problems? Is it more then just an interface problem? Is the idea of a virtual world just leaps and bounds ahead of where we are as a society? It seems like it is too much of a leap to put our minds in a place where aren’t really. The x-factor in all this is the community aspect of the environments. In Second Life, I can interact with someone who lives on the other side of the world just like they were standing next to me. I can have experiences with someone else in ways that I would never be able to have in real life. There is something special about that. I don’t know if it is enough to put Second Life or Outback Online over the edge into mainstream acceptance. I do think though that it will be a driving force in its innovation. People want to find a new ways to stay connected with their friends in better and more efficient ways. This could be one. Have you played with Second Life? What are your thoughts? If you haven’t, download it and let me know what you think. Posted on February 20, 2007 February 21, 2007 Categories Virtual Worlds, WebLeave a comment on Are Virtual Worlds Ready for Primetime? I’m going to be speaking on a panel on Web Accessibility for a brownbag lunch series at the Washington DC Public Library. It is open to the public. Everyone should come. It sounds like it will be a fun event. Here is the text of the announcement. Blind (NFB) in Baltimore, Maryland. Over the last few months I have been growing into a new chapter of my life, in a new part of the USA, and in a new job. To commemorate this new chapter in my life, I figured it’s time to start a new blog. For those of you who are regular readers of my blog Confessions of an Undercover Geek, you may have noticed that I haven’t written for a while. I have been contemplating the idea of doing something new. Undercover Geek has served me well but I have decided to retire it. I really love blogging as a medium for communication and collaboration. It has helped me get to amazing places. As I work to make my “ding in the universe,” this is where I will express my thoughts and flex my brain. I will be writing about topics like various emerging technologies (mobile, Second Life, online video), the World Wide Web, community, collaboration, communication, and a bit about my life. I may do some interviews with other thought leaders. I may even dabble in audio or video podcasting. As always, my blogging is a project of the communications consultancy MyCapitalWeb.com LLC. What’s with the name “Oatmeal Stout”? It has no rhyme or reason. I was just looking for a random name that would stick in people’s heads. I would have to say that Samuel Smith’s Oatmeal Stout is one of my favorite beers.